Milan have really found their form and confidence, so expect full points against an Empoli side who struggle on their travels. The Rossoneri are reborn after the arrival of Lucas Paqueta and Krzysztof Piatek in the January transfer window and are holding on to that last Champion’s League Qualification spot after shaking off Atalanta and Lazio. Last weekend’s 3-1 win from behind over Atalanta in Bergamo gave life to the idea that this is a new Milan, as that was a game they certainly would have lost in seasons past. For the opening 40 minutes the Bergamaschi battered their local rivals, but the Milanese never wilted – and with a striker in such deadly form as Piatek, who netted twice, it is now very difficult to rule them out of a tie. Gennaro Gattuso’s men are now unbeaten in their last seven Serie A matches and have lost just twice in 16. Gattuso will have to do without the services of one of the key attacking cogs in the form of Spanish winger Suso, who is suspended. Samu Castillejo is expected to step in, although Fabio Borini is another option. Giacomo Bonaventura is out for the season, while Ivan Strinic, Pepe Reina, Cristian Zapata and Mattia Caldara are all close to making a return to first team action, but shouldn’t make it in time for this one. The Tuscans, on the on other hand, are coming off the back of an excellent 3-0 win at home over Sassuolo and were able to keep their first clean sheet in Serie A for 21 games – since a goalless draw away to Chievo in September. That win was their first in eight, ending a drought that had lasted since a 2-1 home win over Bologna at the start of December. They picked up just two draws in that period, against Chievo and Cagliari. The Blues haven’t won an away game this season and in fact their last win on the road in Serie A was 2-1 at Milan in April 2017. Coach Beppe Iachini will be keen to for his players to continue the good work started last weekend against the Neroverdi and should be happy with at least point in this game, as Sinisa Mihajlovic’s Bologna are breathing down their necks in the table. He’ll have to do without defender Lorenzo Polvani, who is a long-term injury absentee, while Leonardo Capezzi and ex-Milan full-back Luca Antonelli face late fitness tests. Expect this to be like a training game of defence versus attack, with the home side bossing most of the possession, while Empoli will hope that top goal-scorer Francesco Caputo, who has 11 goals to his name, can capitalize on any opportunities that present themselves in front of goal. Both teams have scored in each of the last eight Serie A meetings between these teams for a total 27 goals. However, Milan have won only one of their last four top flight home games against Empoli, drawing one and losing two. Torino and Atalanta go head-to-head in a fight for Europa League places, as there are only three points separating them going into the weekend. Gian Piero Gasperini embraced the Champions League dream for a while, but the 3-1 home defeat to Milan confirmed Atalanta’s place is realistically battling for qualification to the second continental competition. Even that will be a scrap, as there are only five points separating sixth from 10th. Walter Mazzarri’s Torino are oddly more impressive on their travels than at home, neutralising Napoli for a goalless draw at the Stadio San Paolo last week. Tomas Rincon was booked in that match and is suspended, with Koffi Djidji hoping to recover from injury in time to at least be on the bench. Andrea Belotti’s goal drought stretches on and so does the search for a suitable strike partner, as Simone Zaza seems to have been shelved, with Alex Berenguer challenging Iago Falque for the role. Atalanta, on the other hand, are a goal machine and were until last week the most prolific side in Serie A, now overtaken by Juventus. Compared to the Orobici’s 51 goals, Torino have managed only 28. As with many of Mazzarri’s sides, their strength is in defence, keeping four consecutive clean sheets, even if they only found the net twice in that run. If the Granata manage a fifth straight clean sheet, it’ll be their longest run in Serie A since May 1985. Marten De Roon sits out a ban in midfield, so Mario Pasalic is expected to step in, with Papu Gomez possibly rested after he seemed fatigued against Milan. While Toro struggle at home, Atalanta are enjoying their travels, winning six of the last eight Serie A away fixtures, including three on the bounce. Atalanta have just one victory in their last 35 Serie A visits to Torino, 2-1 in April 2007. However, they are unbeaten in their last five top flight meetings with the Granata, winning two and drawing three, home and away. This is a Lazio regional derby and Roma are confident they can secure a third consecutive Serie A victory against Frosinone in penultimate place. The rumours of Roma’s demise have been greatly exaggerated. Since their blip just before and after the New Year, which included a 7-1 drubbing at the hands of Fiorentina, Eusebio Di Francesco has gone drawn to fellow top four contenders Milan and win three competitive games on the bounce. After a terrible November and early December, it looked as though the Giallorossi were all but out of the race for the Champions League. As we head towards March, they’re only one point behind Milan in fourth and five behind Inter in third. As for Frosinone, their chances of Serie A survival look bleaker by the day. Marco Baroni’s side currently sit second from bottom with the least prolific attack and the second worst defensive record in Italy’s top flight. Due to the sheer difference in quality and playing styles, you can expect Roma to dominate possession and the entire game. The emergence of Nicolò Zaniolo seems to have unleashed a new lease of life throughout Roma’s front line. They now possess the third best attack with 46 goals scored in 31 games, and considering Frosinone’s pitiful defensive record, it’s hard to see them containing the visitors to anything less than two goals. The home side’s form won’t give them much hope either, considering they have just five points 11 games at the Stadio Stirpe. Di Francesco’s side possess an away record of 16 points from 12 games. As for team news, Frosinone’s Italian forward Daniel Ciofani and winger Andrea Beghetto have passed late fitness tests and should make the first team XI, but Paolo Ghiglione, Lorenzo Ariaudo and Stefan Simic are still receiving treatment. Rick Karsdorp and Patrik Schick are still on the treatment table, but Bryan Cristante and Steven Nzonzi battle for a place in midfield. Cengiz Under is back in training, although nowhere near fully fit. Roma have won all three previous Serie A meetings with Frosinone, scoring nine goals and conceding one. That one was from Daniel Ciofani in January 2016. After losing their last three matches, Sampdoria face a must-win game against a highly-motivated Cagliari team. Rolando Maran’s men will look to build upon their recent 2-1 comeback against Parma, so an entertaining game is expected for Sunday in Genoa. The Blucerchiati were angry with their 2-1 defeat at the hands of Inter, but are still only five points away from a European spot, so will look to grab some precious points at Marassi against a decimated Cagliari. Rolando Maran is missing many key players due to injury, such as Valter Birsa, Lucas Castro and Ragnar Klavan, but will also be without striker Joao Pedro, who saw red in their last match, so Leonardo Pavoletti will try to lead his team to victory once again. Sampdoria’s Karol Linetty is suspended, Gianluca Caprari, Gaston Ramirez and Edgar Barreto injured, while veteran Fabio Quagliarella, currently second in the Capocannoniere race is set to lead the attack with January signing Manolo Gabbiadini. Samp have won three of their last four Serie A home games against Cagliari, drawing the other. Cagliari have lost their last four away games, managing only a goal against Lazio back in December. They are without an away victory in 10 attempts, losing seven. Chievo’s hopes of avoiding the drop are getting slimmer by the day, but Genoa have found a new lease of life under Cesare Prandelli. Starting the campaign with a three-point penalty for financial irregularities was always a big obstacle to overcome, but dismal spells under Lorenzo D’Anna and Giampiero Ventura turned that into a mountain. Domenico Di Carlo has brought grit and organisation to the side, but that initial confidence seems to have evaporated after a series of unlucky setbacks. The 4-3 defeat to Fiorentina will probably be seen as the pivotal moment for Chievo, as emerging empty-handed from such a strong performance and with recriminations about refereeing decisions felt like the final blow. They’ve managed just one point in the last five rounds and were unlucky in defeat to Udinese last time out too. Fabio Depaoli and Emanuele Giaccherini are suspended for this game, with Sergio Pellissier, Nenad Tomovic and Nicolas Frey injured, leaving them with relatively few attacking options or experience. Genoa, on the other hand, have flourished since Prandelli took charge, even after selling top scorer Krzysztof Piatek to Milan. Antonio Sanabria has made an immediate impact, finding the net in three of his four games so far. Captain Domenico Criscito completed the comeback to beat Lazio 2-1 last week with a last-gasp volley, giving the Grifone an even bigger confidence-booster that took them up to 13th place in the table. Stefano Sturaro, Oscar Hiljemark, Luca Mazzitelli, Andrea Favilli and Gianluca Lapadula are out of action for a few weeks yet, but it’s a close run thing between Daniel Bessa and Darko Lazovic to start in support of Sanabria and Christian Kouame. Genoa could extend their Serie A unbeaten run to five rounds for the first time since March 2015. Juventus must regain their confidence after a disastrous Champions League defeat to Atletico Madrid, but visit Sinisa Mihajlovic’s rejuvenated Bologna. The Stadio Dall’Ara is already sold out for this Sunday’s fixture. With 21 years separating Bologna from their last home victory against the Bianconeri, and the fact that the men from Turin are coming back from a midweek European match that ended in a huge upset, this match has all the ingredients to be an unpredictable thriller. Coming into the match in 18th place, three points off safety, the Rossoblu have struggled for most of the season, picking up only three wins in the 24 games played thus far. A recent change of Coach has injected some new life into the side from Emilia-Romagna, putting together three impressive performances under Mihajlovic. He beat Inter on his debut, drew against Genoa and lost to Roma largely due to poor finishing. The Serbian’s effect has been positive and he looks to continue to fight for and believe in Bologna’s salvation. The Emiliani will have to continue to be without striker Mattia Destro for this one, as well as Brazilian centre-back Lyanco and former Juventus prospect Federico Mattiello. On a positive note, Rodrigo Palacio returns from suspension, with Riccardo Orsolini and Giancarlo Gonzalez back in the squad too. Juve extended their lead at the top of the table to 13 points, but it’s starting to look like the 3-0 win over Frosinone was the fluke result in a generally poor month. They crashed out of the Coppa Italia to Atalanta, scraped a barely-deserved win over Lazio, drew 3-3 with Parma and were humiliated 2-0 in the Champions League by Atletico Madrid on Wednesday. That setback will raise serious questions about just how far Max Allegri can take this squad and if he can continue to play it so safe with the talent at his disposal. Emre Can will be a missing link in Juventus’s gritty midfield on Sunday due to suspension, while Sami Khedira is out for a month after heart surgery. Juan Cuadrado and probably also Douglas Costa are still out, so the options are limited. With a victory on Sunday, Juventus would become the first team in Serie A history to win 22 of their first 25 league matches, but if they go out of the Champions League in the Round of 16, these records will mean little to the fans. Juventus are unbeaten at the Dall’Ara in Serie A since a 3-0 thrashing in November 1998, followed by 10 wins and five draws. Sassuolo are on poor form and missing suspended Domenico Berardi, but SPAL are fired up and furious after their controversial defeat to Fiorentina. The Neroverdi were tipped to be Europa League contenders after a strong start to the season, but selling Kevin-Prince Boateng to Barcelona and seeing Berardi revert to his usual inconsistent self has seen them slide back down to mid-table complacency. Roberto De Zerbi’s men have won only one of their last eight Serie A games, drawing three and losing four, but above all conceding a whopping 17 goals. SPAL aren’t exactly doing much better, with a lone victory in 15 rounds, but their prospects were never anything more than safety, despite winning their first three matches. The Ferrara-based club currently sit three points clear of the drop zone and that is no margin to be comfortable with, especially now Bologna are revitalised by the arrival of Sinisa Mihajlovic. The Spallini have had a tough week, as they were the guinea pigs for a first in Serie A use of VAR, when their goal was disallowed because there had been an earlier foul in the penalty area in favour of Fiorentina. They eventually went on to lose 4-1 amid tense scenes and protests. Coach Leonardo Semplici might not be on the bench this weekend, as on Monday he underwent emergency surgery to remove an intestinal blockage and has been in hospital all week. Pasquale Schiattarella is suspended for the visitors, with Manuel Lazzari, Mirko Valdifiori and Bosko Jankovic not 100 per cent fit. Alessandro Murgia could therefore get the nod in midfield behind Andrea Petagna, with Alberto Paloschi, Mirco Antenucci and Sergio Floccari all battling for the remaining striker role. Sassuolo are forced to do without banned talisman Berardi, who continues his career tendency to pick up needless yellow cards. This means Jeremie Boga and Filip Djuricic could complete the trident attack with Khouma Babacar, although Enrico Brignola and Federico Di Francesco are also candidates. Marlon remains on the treatment table with a long-term injury. While no team has earned more points coming from behind this season than Sassuolo (nine), SPAL have fumbled leads to the tune of 11 points (fewer only than Empoli on 12). Napoli will be looking to take advantage of Parma’s faltering form when they face the Crociati in Serie A on Sunday. Fresh off securing their spot in the Europa League Round of 16, Carlo Ancelotti’s side will be aiming to fully consolidate their spot in second place. 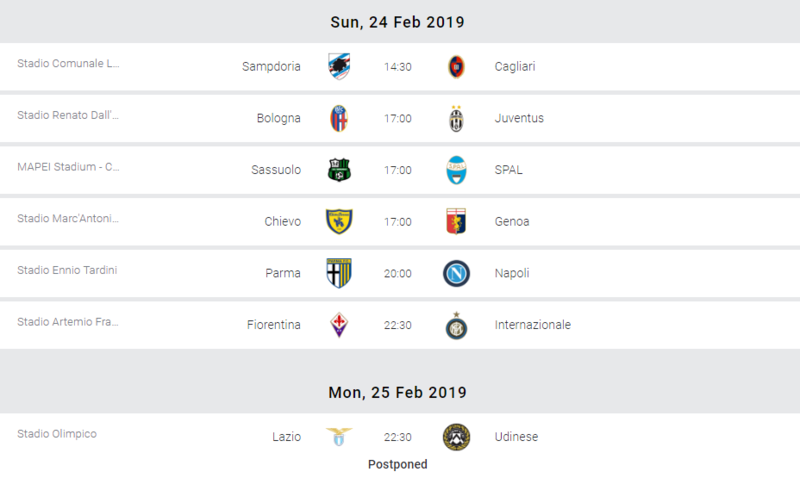 Napoli travel to the Tardini having avoided defeat in their last five Serie A games, but they have drawn three of those fixtures, including their previous two. As a result, the Scudetto now appears a foregone conclusion and, given they were dumped out of the Coppa Italia by Milan, the Europa League now presents the Partenopei’s only chance of winning any silverware this season. Parma, meanwhile, have won just one of their last five games but can’t complain overall. They were not expected to compete for a European spot and, simply put, after several seasons toiling in the lower Leagues, survival was the No 1 objective. Thanks to a solid start in the first half of the season the Ducali appear well on their way, but worrying for the hosts is their rather dodgy form on home turf. Curiously, many of Parma’s impressive results – their 1-0 victory over Inter and 3-3 draw with Juventus – have come on the road. So far, however, they have yet to beat any of the teams in the European football spots at home this term and will be welcoming a side who have lost just one of their last 10 games and, more significantly, four of their last 38 away League fixtures. The visitors will have to make do without Lorenzo Insigne as a result of suspension, while veteran defender Raul Albiol continues his recovery from knee surgery. Amin Younes is another who will be unavailable due to an Achilles problem. As for Parma, Alberto Grassi is a long-term absentee and thus will not be able to feature against the team who own him, but fellow loanees Roberto Inglese and Luigi Sepe will definitely be in the starting XI, hoping to impress against their parent club. Carlo Ancelotti has lost just one of his last 19 meetings with Parma (W13 D5) – a run that includes a 3-0 win as Napoli boss earlier this season. Fiorentina host Inter as two sides in a mixed run of form go head-to-head for vital points in their respective campaigns to qualify for continental football next season. The Viola currently sit in eighth place and are one of the teams fighting for Europa League football, or even Champions League at a stretch if they can pull out a few surprises across the rest of the season. Inter, meanwhile, are in third position, now just four points above fierce rivals Milan, but seven points off Napoli. Fiorentina will be without Kevin Mirallas and German Pezzella for the match against Luciano Spalletti’s Inter. Mirallas, who is currently on loan at the Viola from Premier League club Everton, is still out with a calf injury, whilst Pezzella has a knee problem. It remains to be seen whether Mauro Icardi will take part. He hasn’t played since he was stripped of the captaincy last week and that coincided with a knee inflammation. Even though tests showed no injury concerns, he was again in the stands for Thursday’s 4-0 Europa League win over Rapid Vienna. Inter have if anything thrived in Icardi’s absence, winning three on the bounce against Rapid Vienna (home and away) and Sampdoria. They’ve won their last four in all competition, conceding just one goal along the way. This is a very special match for some ex-Fiorentina players, Matias Vecino and Borja Valero. Vecino scored twice for the Viola in their 5-4 victory in this fixture during the 2016-17 season. It is also a reunion for Stefano Pioli, who was sacked by Inter in May 2017 after just 27 competitive games in charge. Pioli has never been able to beat former Roma Coach Spalletti, managing just two draws from nine meetings. Fiorentina are unbeaten in their last eight games and have had no problem scoring in recent weeks either. At the end of January, the Viola put seven past Roma in the Coppa Italia and scored four against SPAL at the weekend, albeit amid controversy over VAR decisions. The Viola’s last defeat came at home to Parma on Boxing Day. Fiorentina have only failed to score once in their last 13 fixtures against Inter in all competitions.